Bob was born in Sacramento and attended local schools – Christian Brothers High School, Sacramento Junior College and Sacramento State, graduating with a degree in Sociology. He served in the US Coast Guard during World War II and then worked as a parole agent for the State of California Department of Corrections for 30 years. Auburn has been his home since 1970 – a fond and longtime resident of West Lake Road and then The Oaks of Auburn. In retirement, he renewed his passion for learning and took a variety of courses, in particular many classes in poetry. He was a member of the Range of Light poets, the Wordsmiths, and St. Theresa’s Catholic Church. 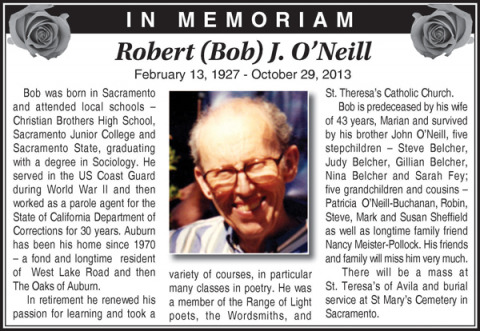 Bob is predeceased by his wife of 43 years, Marian and survived by his brother John O’Neill, five stepchildren – Steve Belcher, Judy Belcher, Gillian Belcher, Nina Belcher and Sarah Fey; five grandchildren and cousins – Patricia O’Neill-Buchanan, Robin, Steve, Mark and Susan Sheffield as well as longtime family friend Nancy Meister-Pollock. His friends and family will miss him very much. There will be a mass at St. Teresa’s of Avila and burial service at St Mary’s Cemetery in Sacramento.